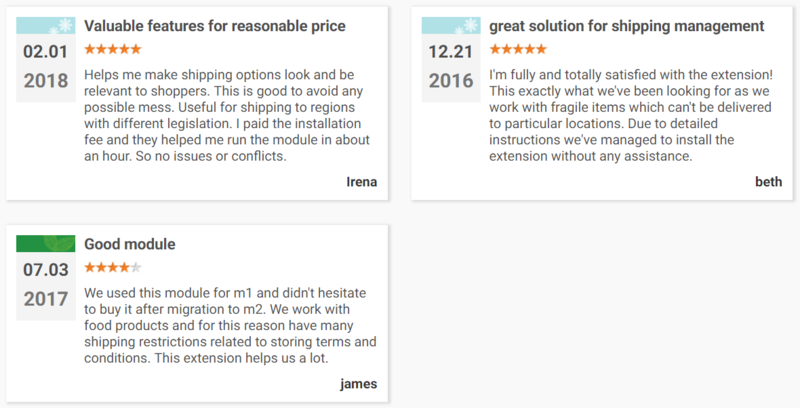 With the help of this Amasty extension, you will get total control over shipping methods. Shipping Restrictions for Magento 2 and 1 allows restricting them on the basis of the cart, product, and customer parameters. As a result, you can easily make shipping process on your ecommerce storefront more cost-effective and fine-tuned according to your requirements. The first and the most crucial aspect of the Amasty Shipping Restrictions Magento 2 module is that it makes shipping legal and cost-effective. Let’s explore each part of the feature in more details. Chances are, you are selling worldwide, and some shipping methods supported in some countries must be restricted in others for legal reasons. While the default Magento 2 does not provide such opportunities, you can leverage this functionality after installing the Amasty Shipping Restrictions Magento 2 extension. Usually, shipping carriers provide customers with various shipping methods, like air, land, sea shipments, and others. With the module, you can restrict specific methods that you don’t want to use without blocking the rest. As for cost-effective shipping, the module allows merchants to disable methods that are not cost-effective. For instance, you know how to send orders to India by plane cheaply but cannot afford the same conditions in the case of Japan. Simply restrict the appropriate method for that country. Shipping rules can be based on various limitation criteria created with the help of the customer, cart, and product attributes. Thus, you can easily restrict shipping for non-standard goods or to distant countries. You can use any product attribute to create limitations which may be used to provide better services. For instance, you sell some premium goods. To provide customers with them in the fastest possible way, restrict ground mail for sending orders that contain these goods. Leave only the fastest and the most reliable methods. It is also necessary to mention that the Amasty Shipping Restrictions Magento 2 module fully supports discounts and taxes. In a situation when you offer free shipping for a specific cart subtotal, and a customer uses a discount code reducing the subtotal below the default sum, free shipping won’t be applied. To keep nose clean, Amasty Shipping Restrictions for Magento 2 restricts next day delivery for the out of stock products. Thus, you will never dissatisfy customers with failed promises. 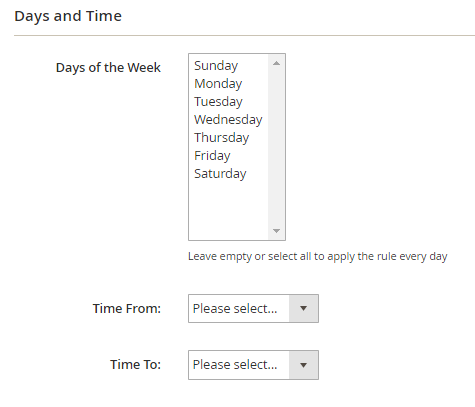 At the same time, you can set restrictions on particular days, like holidays or weekends. As for restrictions based on customer attributes, they are designed to provide particular customers with specific conditions. You can use the feature as a limitation or an additional layer of motivation. The most obvious example may be free shipping for a birthday. In case of customer group restrictions, the Amasty Shipping Restrictions Magento 2 module may be used as a reliable B2B solution. You can freely leverage this functionality to provide wholesale customers with specific conditions. 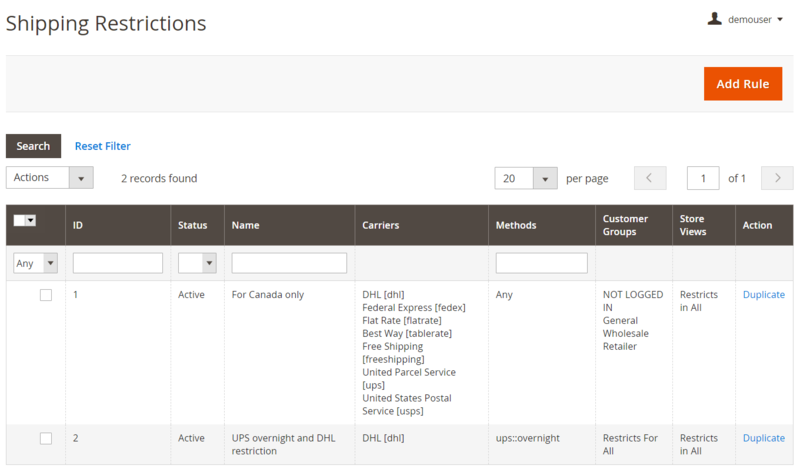 If there are multiple store views, each one can get a unique set of shipping methods. As for coupons, the Amasty Shipping Restrictions Magento 2 extension also provides impressive flexibility. You can either allow free shipping if a customer uses a coupon code or disable coupons for shipping at all. It’s up to you to decide what strategy to choose. Although shipping is not the way you earn money, it makes a significant influence on this process. Inconvenient shipping conditions distract people from buying anything on your ecommerce website and make you lose potential profit. Therefore, it is vital to improve the default shipping system of Magento 2 by installing Amasty Shipping Restrictions. Thus, you will be able to create conditions that satisfy everyone. Actions (you can duplicate the rule and create a new one on its basis). Note that all columns except Checkbox and Action support sorting; ID, Status, Name, and Methods columns have filters. All options related to each rule are divided into five tabs: Shipping Methods, Conditions, Coupons, Stores & Customer Groups, and Days and Time. 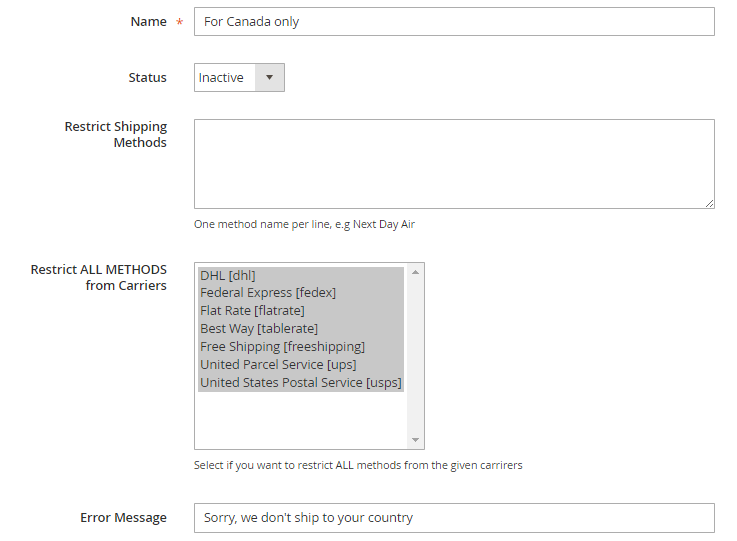 In Shipping Methods, specify such general information as a rule name, status (active/inactive), restricted shipping methods (enter one method name per line), all restricted methods from the specified carriers, and an error message. In Conditions, you have to deal with ‘If ALL/ANY of these conditions are TRUE/FALSE’ statement. It is possible to apply the rule to all orders, backorders only, or non-backorders. 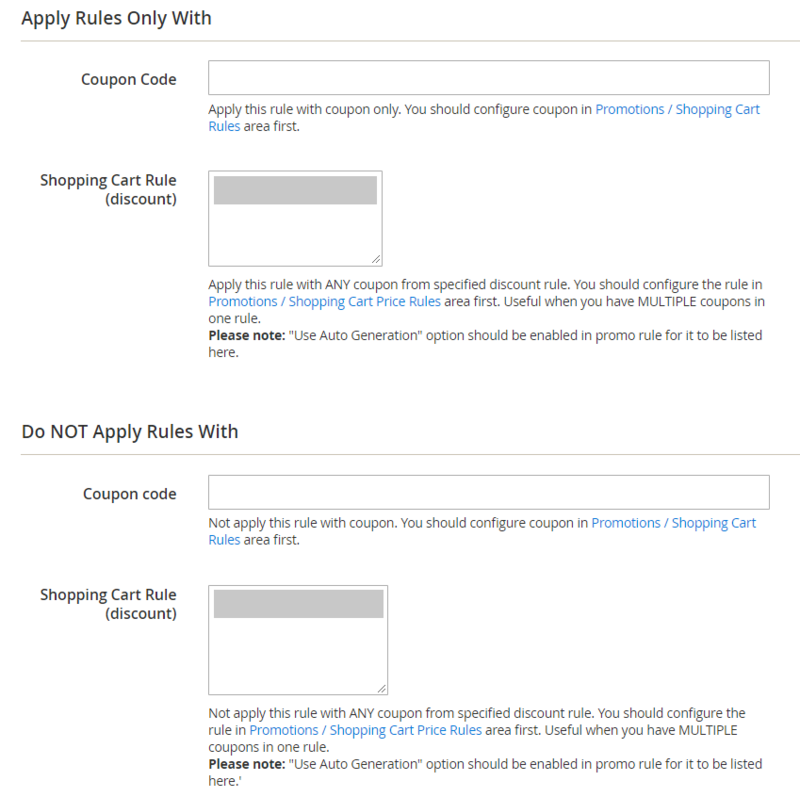 The Coupons tab is divided into two sections: Apply Rules Only With and Do NOT Apply Rules With. Both contain the same options: Coupon Code (the restriction will be applied to the coupon only: configure it in Promotions / Shopping Cart Rules) and Shopping Cart Rule (the restriction is applied to ANY coupon from the specified discount rule: configure the rule first). Options from the second section have the opposite influence. 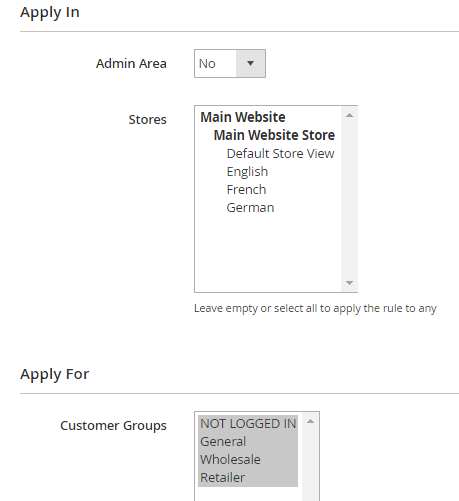 In Stores & Customer Groups, you can apply the restriction in the admin area, as well as to particular store views. Next, choose customer groups which will be able to use the rule. The Days and Time tab lets you choose certain days and a time interval for the rule. As for general settings, they let you include tax in subtotal, use subtotal after discount, and show error messages. Below, you can see an example of Shipping Restrictions at work. 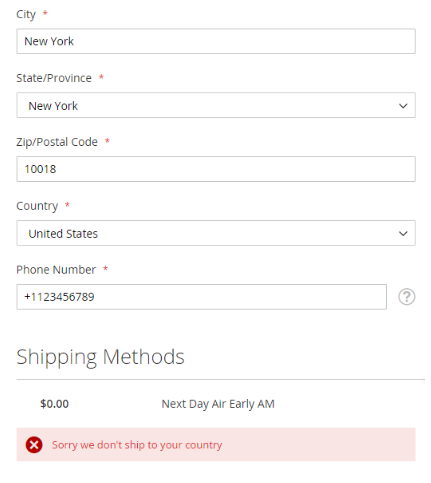 The error message is displayed as the chosen shipping method is not available. New feature: Advanced Conditions are incorporated in the module now. Compatibility with Magento 2.1 was added. 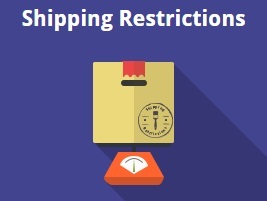 Amasty Shipping Restrictions for Magento 2 and 1 is one of the best tools to get full control over shipping methods provided by your carriers. As you can see, the extension has a very user-oriented backend interface and offers all options necessary to customize shipping according to the most demanding business requirements. As for the price of the module, it depends on the platform version: Magento 1 extension costs $99, while Magento 2 module is a little bit more expensive – $159.